On a lonely battlefield you meet your opponent for a skirmish that will decide the fate of your army. You must plan the battle, advance your men, attack and capture the enemy Flag. Your Marshal is your strongest man, but vulnerable if not protected from the Spy. Your Scouts are weak but mobile and effective in discovering your enemy's manpower. You need the skills of Miners to disarm enemy Bombs, so don't lose them all early in the battle. Plant your Bombs skillfully. They will protect the most precious piece on the gameboard, your Flag. 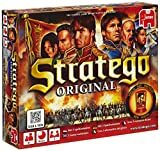 Stratego is a game where skillful planning, clever deception and good memory work are used to defeat your opponent. Every time you play the battle is different. And now, new Tournament Rules can give you more variety than ever. 1. 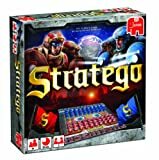 Place the gameboard between you and your opponent with the name Stratego facing each of you. 2. Hide a red piece in one hand and a blue piece in the other. Your opponent chooses a hand and plays with the color army the selected piece designates. The other color army is yours. 3. 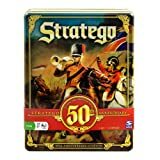 Set up your armies using the strategy hints and rules for movement and attacking that are discussed below. 4. Place your pieces on the gameboard with the notched end up. The printed side faces you so your opponent cannot see the rank of your pieces. Your opponent does the same. 5. Only one piece can occupy a square. Place them anywhere in the last four rows on your half of the gameboard. The two middle rows are left unoccupied at the start of the game, as shown in Figure 1. The object of the game is to capture your opponent's flag. You and your opponent alternate turns. The red player moves first. Move -- one of your playing pieces to an open adjacent space. Or Attack -- one of your opponent's playing pieces. 1. Pieces move one square at a time, forward, backward or sideways. (Exception: see Special Scout Privilege, Rule 6). 2. Pieces cannot move diagonally. They cannot jump over another piece. They cannot move onto a square already occupied by another piece (unless attacking). 3. Pieces cannot jump over or move onto the two areas in the center of the gameboard that are indicated by the dotted lines. See Figure 1. 4. A piece cannot move back and forth between the same two squares in three consecutive turns. 5. Only one piece can be moved on a turn. 6. Special Scout Privilege: A Scout can move any number of open squares forward, backward, or sideways. But remember, this movement will let your opponent know the value of that piece. You may wish to move your Scouts one space at a time to confuse your opponent. Scouts are the only pieces allowed to move and attack on the same turn. See Rules For Attack, below. Remember, the Bomb and Flag pieces cannot be moved and must remain on the squares where they were originally placed throughout the game. 1. Attack Position: When a red and blue piece occupy adjacent spaces either back to back, side to side, or face to face, they are in a position to attack. See Figure 2. 2. How To Attack: To attack on your turn, take your attacking piece and lightly tap your opponent's piece. Then, declare the rank of your attacking piece. Your opponent then declares the rank of his/her defending piece. 3. The piece with the lower rank (and lower number) is captured and removed from the board. If your piece (the attacking piece) is the remaining and winning piece, it moves into the space formerly occupied by the defending piece. If the remaining and winning piece is the defending piece, it stays on the square it was in when it was attacked. 4. When pieces of the same rank battle, both pieces are removed from the game. 5. Attacking is always optional. 1. A Marshal (Number 10) outranks a General (Number 9) and any other lower-ranking piece. A General (Number 9) outranks a Colonel (Number 8) and any lower-ranking (but higher numbered) piece. A Colonel (Number 8) outranks a Major (Number 7) and so on down to the Spy which is the lowest-ranking piece. 2. Special Miner Privilege. When any piece (except a Miner - ranked 3) strikes a Bomb, that piece is lost and removed from the board. When a Miner strikes a Bomb, the Bomb is defused and removed from the gameboard. The Miner then moves into the Bomb's space on the board. Bombs remain on the same square throughout the game unless they are defused. Bombs cannot attack or move. 3. Special Spy Privilege. A Spy has no numeral rank. If any piece attacks it, it is captured and removed from the board. But the Spy has a unique attacking privilege. It is the only piece that can outrank a Marshal providing the Spy attacks the Marshal first. If the Marshal attacks first then the Spy is removed. 1. Place Bombs around the Flag to protect it. But place a Bomb or two elsewhere to confuse your opponent. 2. Put a few high-ranking pieces in the front line, but be careful! If you lose them early in the game you're in a weak position. 3. Scouts should be in the front lines to help you discover the strength of opposing pieces. 4. Place some Miners in the rear for the end of the game, where they will be needed to defuse Bombs. The first player to attack an opponent's Flag captures it and wins the game. If all of your moveable pieces have been removed and you cannot move or attack on a turn, you must give up and declare your opponent the winner. Here are three rule variations included for the Stratego player who wants an added challenge. Feel free to add one or any combination of these rules to the game. When pieces of the same rank battle, the attacking piece wins. When an attack is made the attacker is the only player who has to declare the rank of his/her piece. The defender does not reveal the rank of his/her piece, but resolves the attack by removing whatever piece is lower-ranking from the gameboard. Players keep their own captured pieces. Exception: when a Scout attacks, the defender must reveal the rank of his/her piece. When you move onto a square in your opponent's back row you have the option of rescuing one of your captured pieces. Immediately pick any piece from the pieces your opponent has captured and return it to the gameboard. Place your rescued piece on any unoccupied space on your half of the gameboard and your turn is over. Scouts cannot make a rescue. You cannot rescue a Bomb. Only two rescues can be made by each player. The same playing piece cannot make both rescues.